According to the regular survey of the prices of daily necessities in Nov., the drop of the price of lettuce (34.3%) was the most remarkable among the 37 products surveyed, and the items of which prices have dropped included spinach (19.0%), pear (11.0%), radish (12.9%), pork (4.7%) and Chinese cabbage (15.4%). On the other hand, the prices of mackerel (5.2%) and chicken (3.6%) have risen. The general prices of agricultural and stock farm products have fallen by 3.0% from the previous year. The prices of industrial products rose a little by 0.1% from the previous month. The prices of wheat flour (6.6%), cooking oil (4.4%) and toothpaste (3.0%) also rose. On the other hand, the prices of Ramyeon (Korean instant noodle: 4.4%), sesame oil (4.1%) and Yogurt (2.8%) have dropped. Measured by the total sum of the average price of 37 items, Goyang City was the highest (196,325 won) and Jinju City was the lowest (178,390 won). Korean Federation of Housewives Club (President: Cheon-ju Kim) conducted a survey on the prices of the 14 items necessary to make pickled vegetables prepared for the winter at the representative conventional markets and large marts. Making Kimchi to eat during the winter is a unique Korean culture and has been an indispensable annual event at home. Especially, the harvest of Chinese cabbage in Korea has was reduced and as a result its price soared in the season of making Kinchi for the winter and so many ordinary people are delaying the event. (In Seoul, the peak will be the 1st & 2nd week of December.) Accordingly, the Korean Federation of Housewives Club has conducted a survey on the price of the materials necessary for making Kimchi for the winter to provide consumers with various kinds of information for their choice. ◆ The price with (+) mark is for the items of which prices are cheaper at large marts, and the price with (-) mark is for the items of which prices are cheaper at conventional markets. (1) Among the 14 items in total, the average prices for 10 items except 4 items (Chinese cabbage, leaf mustard, small green onion and Altari radish) were cheaper at conventional markets. (2) According to the prices surveyed in April, the average price of Chinese cabbage was 1,636 won at conventional market and 1,556 won at large marts. But in the recent survey in the season for making Kimchi for the winter, it was 3,427 won at conventional markets and 3,110 won at large marts, which is an increase of more than double. - Mrs. Hwang, a housewife who was born in Seoul, does not use any salted marine products other than shrimps and add only live shrimps to improve the crunching taste of Kimchi. If she uses a conventional market it will cost her 178,206 won to buy the materials necessary for 20 heads of Kinchi for the winter and can save about 36,925 won compared to the cost if she uses a large mart. ◆ The difference in the number of the markets survey is cause by the absence of the concerned items in a market. Among the 70 markets in total, the markets that do not have the concerned items were excluded from the number of the markets surveyed. (1) Among the 14 materials necessary for making Kimchi for the winter, the item which indicated its place of origin the best was red pepper powder (72.5%) while radish and Altari radish rarely indicated their place of origin. (2) Especially, though the prices of salted shrimps (including the shrimps salted in June and those salted in autumn) and live shrimps differed considerably than other items, the ratios of the indication of their place of origin were 54% (shrimps salted in June), 52% (shrimps salted in autumn) and 34.3% (live oyster) respectively, lacking accurately information for the choice of consumers. The prices of the shrimps salted in June differ by 10,000 ~ 40,000 won per 1 kg and the prices of the shrimps salted in autumn differ by 4,000 ~ 20,000 won. Though they are used much for the making of Kimchi for the winter, the ratios of the indication of their place of origin is only a little more than 50% and thus it cannot be ruled out that imported salted shrimps may be sold as Korean made products. 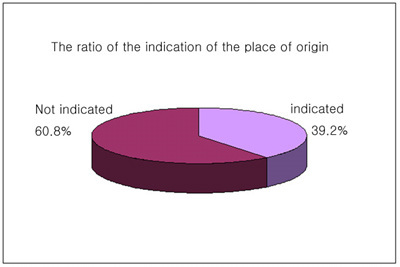 (3) The ratio of the indication of the place of origin is still very low: among the 14 items, an average of 39.2% indicated their place of origin and 60.8% did not indicate their origin. 1) The strongest competitiveness of conventional markets is cheaper and fresh agricultural, marine and stock farm products. In the survey this time for the prices of the materials to be used to make Kimchi for the winter, it turned out that 10 out of the 14 items surveyed were being sold cheaper at conventional markets. 2) A problem that still needs to be corrected is the indication of the place of origin. In the survey, among the 21 large marts and department stores only 1 place did not indicate the places of origin of several products, and the rest 20 places indicated the places of origin for all the 14 items, which was contrasted to the situation of conventional markets. There are problems with consumer too. According to the concerned people in conventional markets about their situation, it is natural that consumers will naturally look for cheaper product in conventional markets and imported products are much cheaper than Korean-made products. Still, they often do not choose the products that are marked imported ones. If there are no indications of the place of origin, consumers select them even if they may suspect that they are being cheated, but they do not select the imported goods once they come to know that they are imported ones. Consumers choose imported products easily at department stores or large marts despite of the indication of their place of origin, but the have a dual measuring stick and do not buy imported products at conventional markets once they notice the sign of their place of origin. That is why the ratio of the indication of the place of origin does not increase at conventional markets. While consumers prefer cheaper but good-quality products, it is of common sense to think and accept that quality and price go side by side, and it is natural that in conventional markets, too, prices are set according to the quality of the products. Thus, high-quality Korean products are to be more expensive than imported ones in conventional markets, too. If it is true that the vendors in conventional markets avoid putting up the signs of the place of origin due to the negligence of consumers in checking the place of origin, consumers need to change their attitude of dealing in the market. In order to develop conventional markets to cherish Korean cultures and traditions, consumers must have wise consuming attitudes. 3) When the survey was being conducted, there were much salted Chinese cabbages in the market. Salted Chinese cabbages are often used these days to save the chores done during the preparation of the Kimchi for the winter. Regarding this, consumers’ complaints are registered which claim that the Kimchi made with the purchased salted Chinese cabbage pick up flavor much earlier than usual. There is a possibility that the salt used during the preparation of the Kimchi for the winter may have some problem and thus consumers need to check the place of origin of especially the salt they use. An inappropriate choice of the materials to be used for the preparation of the Kimchi for the winter may make all the hard working a vain effort and therefore consumers need to select the materials real carefully.